The 1980s were a time to wear sunglasses at night, to strap a sweatband straight across your forehead before Jazzercise class. Big hair was in and fat was out — of everything. The fat-free food craze dominated the food industry in the 1980s and ’90s and left a mark on our menus and grocery stores. Dietitians urged consumers to stay away from fatty foods. Consequently, people pushed aside foods like almonds in exchange for grains. This lead to a rise in obesity, which left many Americans wondering why. Turns out, when you extract all fat from your diet (good and bad) you are more likely to be hungry. Take away the fats from a healthy body needs and you will likely have a diet that is sugar heavy. Fat is good for you but it must be the healthy kind (I know, healthy fat sounds like an oxymoron). Fat is a major source of energy, helping us absorb necessary minerals and vitamins. It is also needed to build cell membranes. But all fat is not created equal. Trans fat is mega unhealthy; it should be consumed minimally, if at all. Trans fat is a result of hydrogenation, a process used to preserve food (think frozen pizza and fast-food cheeseburgers). Trans fat increases a person’s risk of stroke, diabetes and heart disease. Humans made trans fat for convenience, and there is truly nothing healthy or natural about this human made product. Occupying a gray area is saturated fat. Saturated fats are common in coconut oil, dairy products and other animal products. Like trans fat, consuming too much of this can lead to high cholesterol, diabetes and heart disease. Saturated fats are not exactly healthy but they are fine to eat in moderation. A yogurt for a breakfast or an occasional puff pastry is not going to wreak havoc on your body. Additionally, saturated fat provides energy and will repair cells. 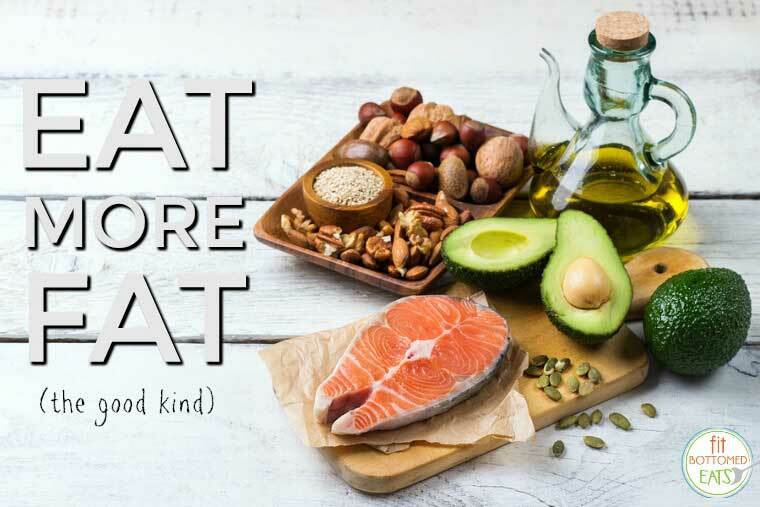 Monounsaturated fat has fewer hydrogen atoms bonded to its carbon chains, meaning it can improve your cholesterol, curb your appetite and improve your overall health. In fact, most health professionals recommend having a diet rich in this type of fat. You can find this product in olive oil, most nuts, avocados and cold-water seafood, such as salmon. Polyunsaturated is another healthy fat that’s great for your body. It has the potential to lower your cholesterol and reduce your risk for heart disease. Polyunsaturated fats includes omega-6 and omega-3 fats. These fatty acids are essential because our bodies do not produce them naturally. We can only get these fatty acids by consuming food. Similarly to monounsaturated fat, polyunsaturated fat is found in walnuts, flax seeds, fish, soybean oil and safflower oil. Much like big hair and blue eye shadow, the fat-free craze of the 1980s is a dead trend. Now, the focus is on balance. Rather than worrying about dieting or consuming too much fat, focus on eating whole, natural foods. Colorful veggies and fruits paired with proteins rich in healthy fat is the way to go. And what the hell, occasionally indulge in Ben and Jerry’s — it’s all about balance after all. Great article, Unfortunately, fat has received a bad rap for decades. So much so, that it has become ingrained in our minds to intuitively reach for anything that says “low fat” even when we know better! Hello the article is sound good, hey I follow fish and nuts for the way to healthy fat. Loved this article! Super informative and made me realize we’ve got to get more fats in this week. We’re an up and coming blog and would love for you to check out our site! We usually have a phobia that if we will consume more fat, we will look fat. But after this post, I have realized that not all the fat cause fat. Sometimes it’s really important to have a good guide and this is the one. Potatoes have carbs and fats both which are best for muscle building but especially for those who are a fitness freak and I think this is the best form of fat. Great breakdown of fats! I’ve been looking for a post like this for ages. Thanks for sharing this. good blog !!! Apart from that we can also take some herbal supplements like cod liver oil, flex seed oil etc. Getting the information out there to people to focus on the healthy fats is important! Fats aren’t bad, it’s the KIND of fat that people consume that determine whether it’s good or bad. Avocados, nuts, flaxseed, etc are not what people should be afraid of! As you mentioned, those are the awesome ones! Thank you for an informative post! Wow! Noone has ever teach me better about bad and good fats. Thank you for this article. Thanks for sharing great blog i like it.